Optional dining seating ~ Benches and Chairs. ​Ball Return ~ Both Styles work great for dining. Chic Collection of Tables; Optional Wired Ball Return on minimalist tables - $380.00 - (pops-down/up...out of the way). Otherwise ships standard with modern hidden drop pockets. 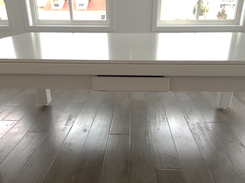 Volume Collection of Tables; Table with drawer have a concealed ball return to the drawer. (no additional cost.~$0.00). It can't have drop pockets or pop up/down ball return. Available on all Volume Collection tables. All Volume Tables have drawers. Not available on Chic Collection of tables. Chic Tables have no drawers. ​Hydraulic legs are used to lower the height 1.5" during dining,(from 31.5" to 30"). 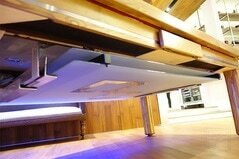 ​The hydraulics are actuated up or down by a simple lift of the end of the table. 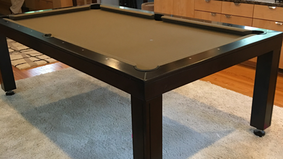 All our pool tables are the same regulation pool height when playing with or without the optional hydraulic legs. ​Hydaulic legs are available on all the Chic Collection tables. Optional rechargeable DC battery to power the neon lights.~ $150.00. 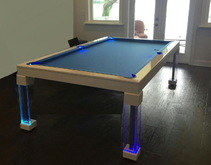 Contact us today for the custom designer - ultra modern pool table of your dreams!